ATN NVMPAN14H0 NVM14-HPT Night Vision Monocular FREE SHIPPING! The ATN NVM14-HPT is an extremely versatile monocular-style night vision system that can be mounted on headgear, a helmet or a weapon, as well as used in the hand. It can also be fitted to a camera for low-light photography, and is compatible with most infrared lasers. 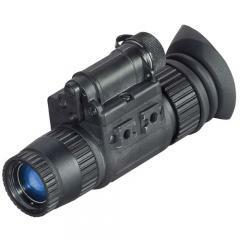 Its high-resolution HPT intensifier tube and high-grade multi-coated optics produce a clear, sharp image, allowing you to observe and track your target as easily as in daylight. Its automatic brightness control and bright light cut-off systems deliver a consistent image despite changing light conditions and also protect the intensifier from damage. In total darkness, the infrared flood illuminator takes over to provide the illumination that you need to see without giving away your position like a flashlight. Ergonomic controls provide fore-and-aft adjustment and focus, and battery, IR and excessive brightness indicators inside the eyepiece allow you to perform status checks without lowering the monocular. ©2002-2019 CopsPlus.com: ATN NVMPAN14H0 NVM14-HPT Night Vision Monocular FREE SHIPPING!